string(1234) "Resource Centre > Uncategorized > Child Labour and Tourism. How Travel Companies Can Reduce Child Labour in Tourism Destinations"
The estimates range for children working in tourism run from 13 to 19 million children under the age of 18 which counts for around 10-15% of the formal tourism labour market (Black, 1995). 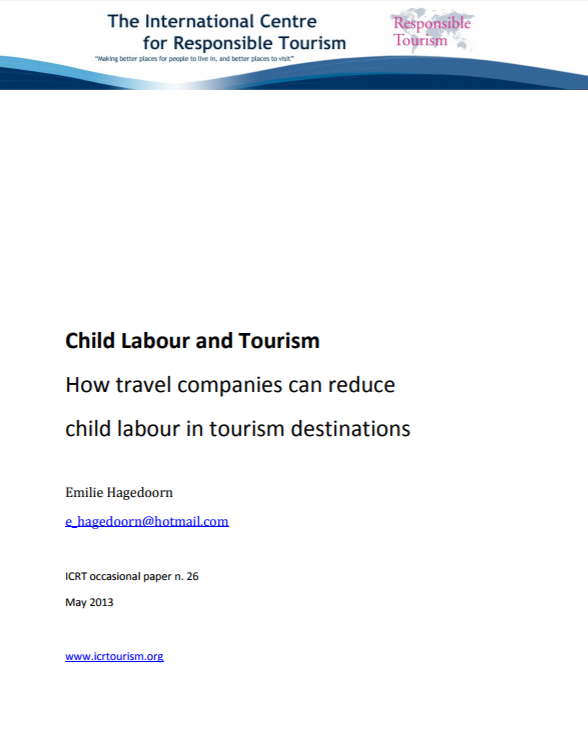 This paper is based on the findings from a research report called Child Labour and Tourism: How travel companies can reduce child labour in tourism destinations written by Emilie Hagedoorn in 2011. The aim of the research was to identify ways in which travel companies can reduce child labour in tourism destinations and begin to measure performance and progress in this area. This paper aims to share a summary of these findings and recommendations with other interested travel companies. Documenting the impact of new legislative acts is an indispensable tool for improving the effectiveness of this legislation and advancing business practice.